Three preachers, in 1948, felt the need to come together and rent a state park on Orcus Island for a week of summer camp. The first year the attendance totaled 80 campers. That was enough encouragement to rent three weeks for the next summer. For 16 years they grew but were allotted only three weeks at the state park. Some weeks they were running two programs at the same time; and by the fall of 1963 they realized they needed property to build a camp of their own where they could grow and be even more effective for the kingdom. 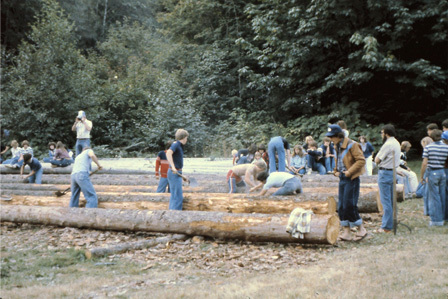 In January of 1964, they incorporated and became Puget Sound Christian Service Camp. They purchased 170 acres of land which had previously been an old coal camp near the town of Mineral at the head of Pleasant Valley. The coal camp consisted of 5 cabins and a few sheds. In the summer of '64 they expanded their programs to 6 weeks of summer camp. The camping was very primitive, as the cabins were old mining shacks, so they added three large tents. A generator was used for electricity, and they used hand cranked pumps for their water supply. With a place of their own and the need for buildings, the cooperation grew and the churches rallied behind the need. By 1970 there was a lodge/dorm/dining hall, two dorm cabins, a restroom, pool, campfire area, camp store, outdoor chapel, shop, septic system, electricity, and well water. Things were still rough and in various stages of use, but the camp was up and running. During the 70's the camp added summer staff trailers, a gym, manager's residence, RV sites and play equipment. The 80's brought more growth and the programs grew to 12 weeks of camping. By the early 90's the camp stepped out again in faith and developed a new additional 100 bed camp at the Pleasant Valley property designed to be a summer use only camp. This would allow for larger camps and could also be used for running two separate camps during the same week. Construction on this new camp continued from 2000 to 2010. This new camp consisted of 11 cabins, a restroom and a meeting building. In addition to this a new RV area, a shop, an office, and a recreation area with basket ball, archery, mini golf, and volley ball courts were built. What started out with three preachers is now supported by churches throughout Western Washington, and continues to call the Christian Church fellowship together to equip, encourage, and evangelize youth and families using Christian camping. Original camp, situated near the present day location of the Mangers' house. The original mining camp as you drove in, before the cabins burned down - the reason the first caretaker was hired. This building marked the mine shaft. It was located just above the current swimming pool area. Bob Sanders resting on the bridge. Early camp, with Lou Whitney in the foreground. Debarking trees for the A-Frame. Electrical power comes to the camp.